Sewu Temple is located 2 km north of Prambanan Temple. This is the second largest Buddhist Temple complex in Java; Restoration is professionally underway to reach its original form. It is a MANDALA, manifesting the universe in the center temple of Mahadeva, surrounded by four rings of 250 smaller temples of Gods. 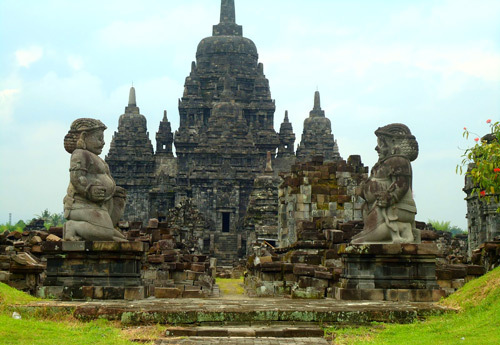 Sewu Temple complex is located in Prambanan Temple Park area, about 800 meters to the north of Rara Jongrang Temples. The fact that this temple was built near Prambanan Temple, which is a Hindu temple, indicated that the Hindus and Buddhists lived in harmony. The main temple has 1 main room and 4 small rooms of which are doorways to the temple. The east door serves as main door to the main room. That way, the main temple faces to the east. The structure has 9 ‘roofs’; each of them forms a stupa on the top. It is believed to be a royal temple and was one of the religious activity centers in the past. Based on the inscription dated back to 792 AD, which was found in 1960, the name of the temple complex was probably “Manjus’rigrha” (The House of Manjusri). Manjusri is one of Boddhisatva in Buddhist teaching. Sewu Temple was probably built in the 8th century at the end of Rakai Panangkaran administration. Rakai Panangkaran (746 AD – 784 AD) was a popular king from the old Mataram kingdom. HC Cornelius studied the temple firstly in 1807. NJ Krom did the first archeological study in 1923.